Harrisburg News Company is one of the largest regionalized magazine, book, and newspaper wholesale distribution companies in the nation. 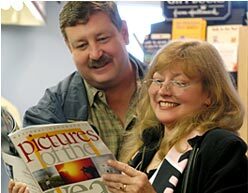 We make the purchase of magazines and books an enjoyable experience for shoppers by providing neatly-organized, specially-designed displays where every title—national and regional—is easy to locate. Our magazine, newspaper and book departments attract higher-income, better-educated customers—which means increased sales throughout the store.